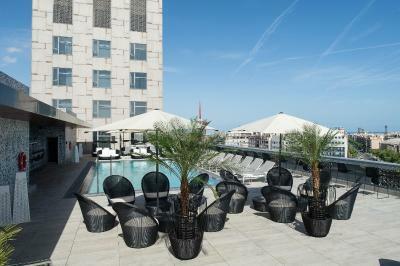 Lock in a great price for Catalonia Barcelona Plaza – rated 8.7 by recent guests! Location to Metro, friendly, helpful staff. Easy , fast, and inexpensive access to and from airport. Room was clean, comfortable and front desk staff was super nice. Location was great! Some snacks were provided, which was good as well. My room had an excellent view (city view) and I really enjoyed it!!! Hotel breakfast was also great with a variety of options for food! Wonderful city view from the terrace. Perfect location. Excellent location. Central to everything include train and busses and a wonderful stay. Worth it for sure ! We were upgraded to a premium room which was fantastic. Lovely view from the top floor. Staff was friendly and helpful. Lobby looked nice, food was good, lots of taxi and great location. The staff at the reception is perfect, speaks french and gave us a beautiful and very confortable room. The hotel has big volume with nice areas. The sushi restaurant is excellent. 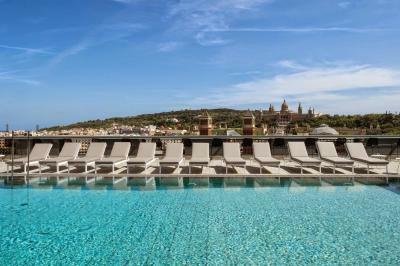 But most of all the view on plaza de Espana and the fountains is exceptional from the rooftop pool (and our room). As it's a big hotel there is 24/7 a taxi available in front. 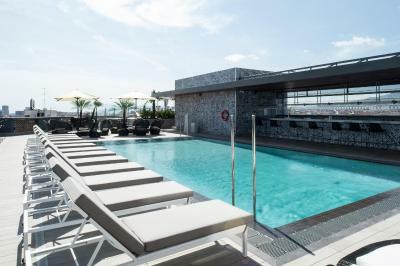 Catalonia Barcelona Plaza This rating is a reflection of how the property compares to the industry standard when it comes to price, facilities and services available. It's based on a self-evaluation by the property. Use this rating to help choose your stay! 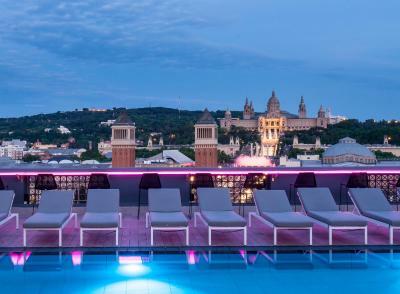 One of our top picks in Barcelona.Located in Barcelona’s Plaza España, Hotel Catalonia Barcelona Plaza has a seasonal rooftop pool and terrace with 360º views of the city. 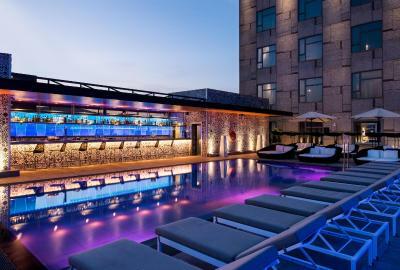 It offers a fitness room, beauty salon and free WiFi. 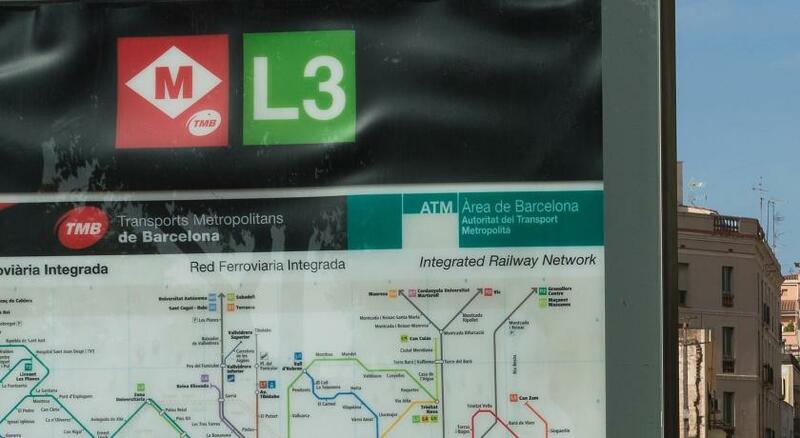 Espanya Metro Station is outside the hotel. 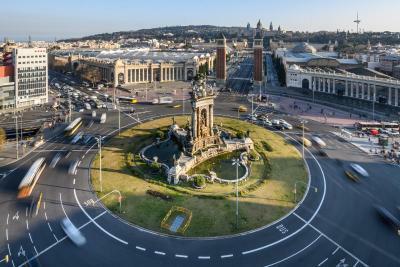 There are also many bus stops on the square providing guests with easy access to the city, the Fira and Barcelona Airport. 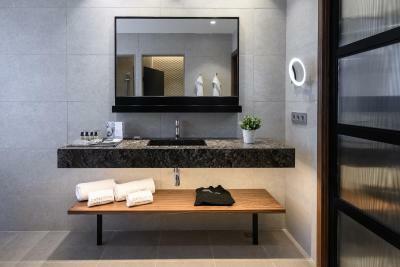 All spacious and air-conditioned rooms have a satellite TV, a safe and a private marble bathroom complete with a hairdryer. There is free WiFi available throughout. 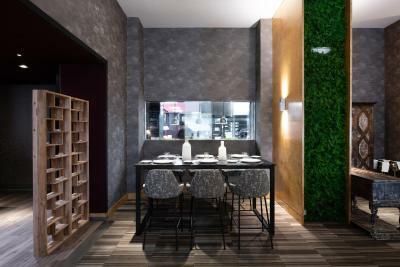 A buffet breakfast is served every morning; and the Filigrana Restaurant at Catalonia Barcelona Plaza serves Catalan cuisine with local produce. 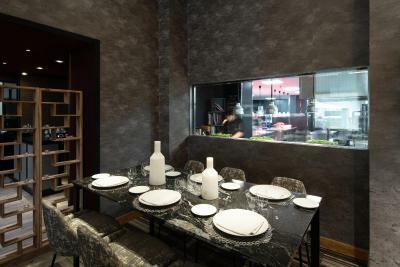 The Gourmet Corner offers food until late and there is also a Japanese restaurant, Kurai. 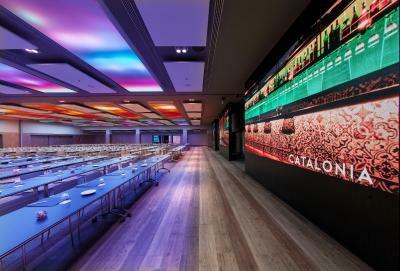 Catalonia Barcelona Plaza also has a large business center and meeting rooms equipped with the latest technology. 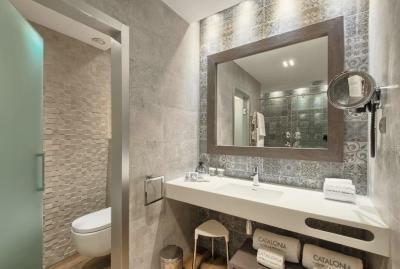 When would you like to stay at Catalonia Barcelona Plaza? 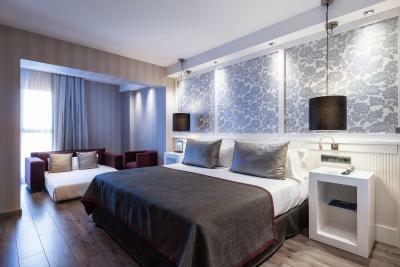 This air-conditioned room has attractive décor with hardwood floors, and a marble bathroom. 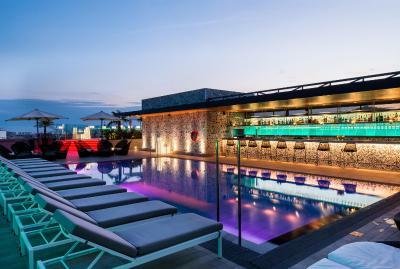 It comes equipped with free Wi-Fi and satellite TV. 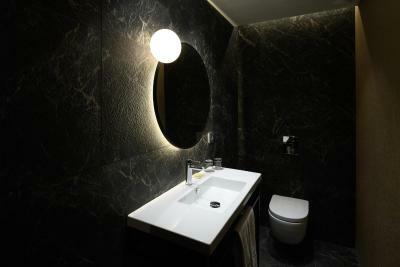 This air conditioned room has attractive décor with hardwood floors and a marble bathroom. 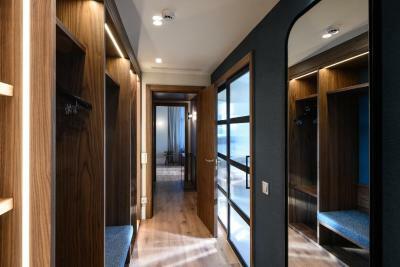 It comes equipped with free Wi-Fi and satellite TV. The room also comes with a bottle of water and some chocolates. 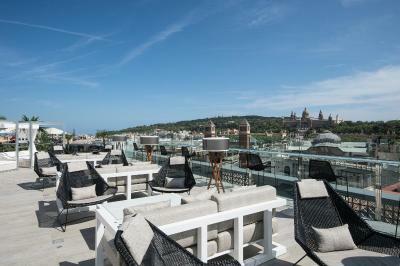 It offers views of Plaza España and Montjuïc. 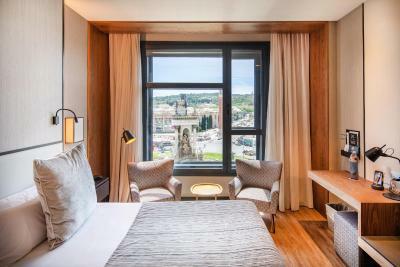 This room offers views of Plaza España and Montjuïc and give free access to the Executive Corner, which offers a selection of soft drinks and snacks from 12:00 to 20:00. 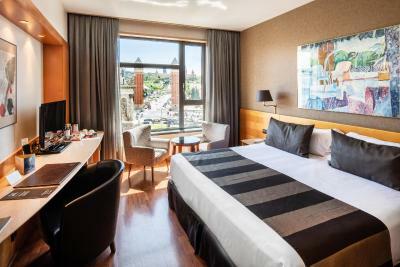 These large suites offer views of Plaza España and Montjuïc. 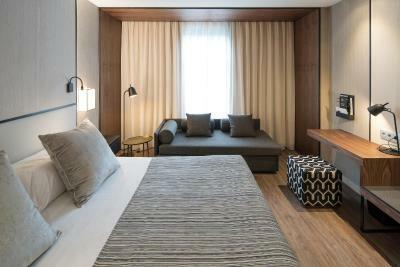 There is a spacious seating area and a king-size bedroom with a pillow menu. 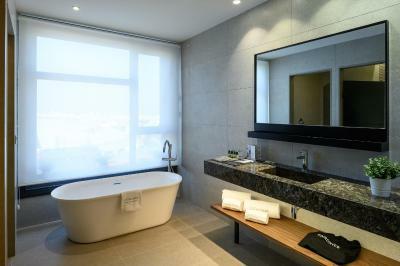 The suite also comes with a Nespresso coffee maker and 2 flat-screen TVs, one in the bedroom and one in the lounge. 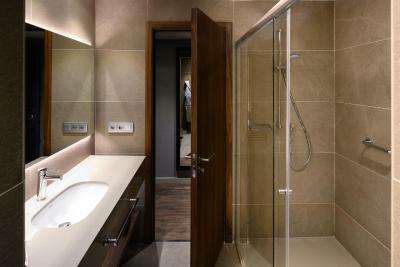 The bathroom includes a double shower, hairdryer, full-body mirror and a vanity mirror. 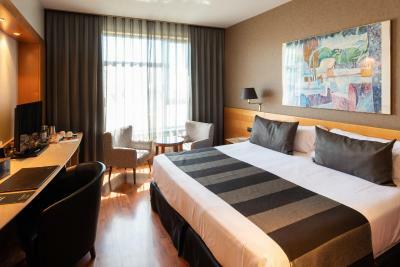 This room has free access to the Executive Corner, which offers a selection of soft drinks and snacks from 12:00 to 20:00. 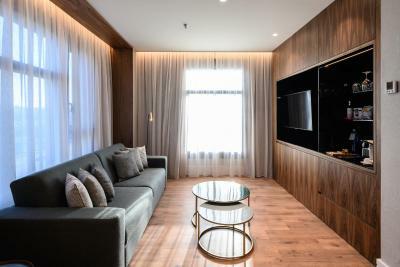 Set on the 7th-floor, these modern, air-conditioned suites come with a Nespresso coffee machine, a pillow menu, a mini-bar with water, satellite TV, and a turn-down service. There is a private bathroom with slippers and bathrobes. The room also comes with welcome water and chocolates. This room has free access to the Executive Corner. The Executive Corner offers a selection of soft drinks and snacks from 12:00 to 20:00. 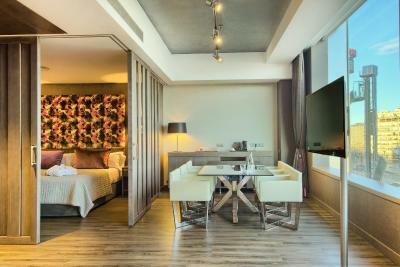 Located on the top floor, these modern, air-conditioned rooms come with coffee and tea facilities, satellite TV, and a turn-down service. 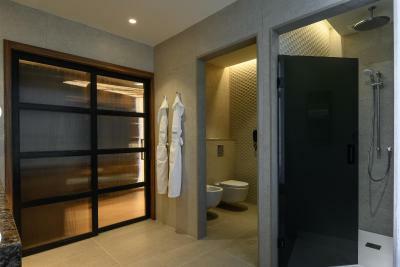 There is a private bathroom with slippers and bathrobes. The room also comes with a bottle of water and some chocolates. 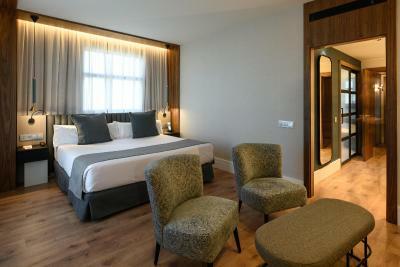 These family rooms are on the 7th floor and have a king-size bed and a double sofa bed. This room has free access to the Executive Corner; which offers a selection of soft drinks and snacks from 12:00 to 20:00. 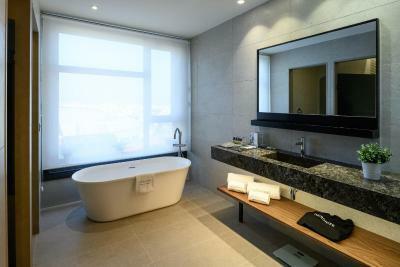 This superior room with terrace comes with a bathroom with a round bath and a separate shower. It has a 7-square yard terrace accessible from the bedroom. 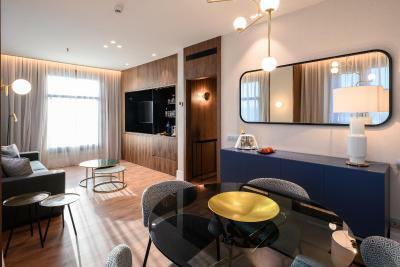 These suites have a bedroom with a king-size bed and a living room with sofa bed and two bunk beds, a bathroom with shower, plenty of storage space and spectacular views of the city. 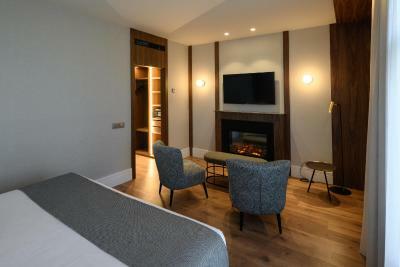 Refurbished in 2018, these rooms have a smart TV, USB charging station and a Nespresso Coffee Machine. 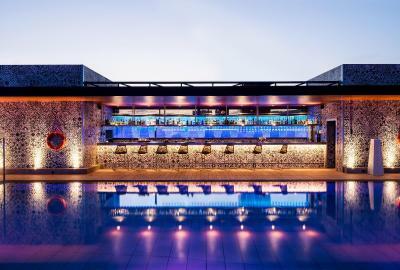 Located on the 5th and 6th floor, they have free access to the Club Corner; where guests can find a selection of refreshments and snacks from 12:00 to 20:00. 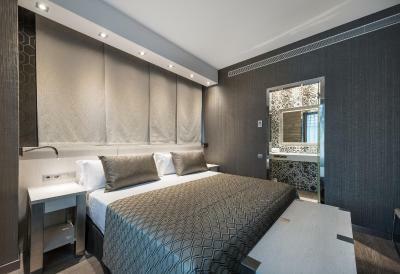 Facing Plaza España and refurbished in 2018, these rooms have a smart TV, USB charging station and a Nespresso Coffee Machine. 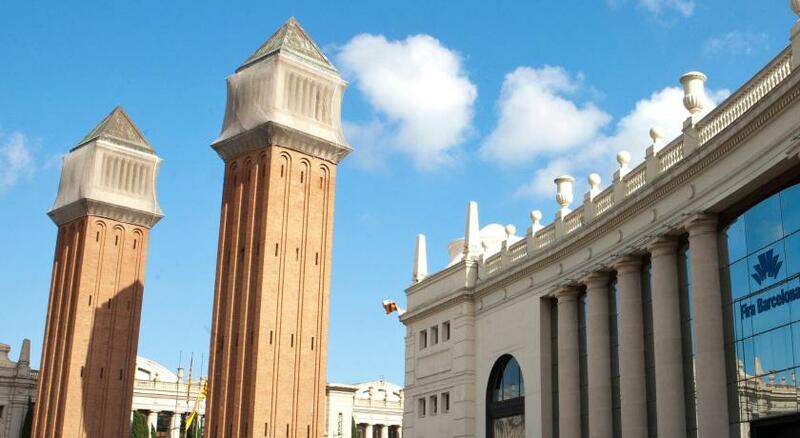 Our hotel is situated in Plaza España, next to the Fira de Barcelona facilities and Montjuïc Mountain. 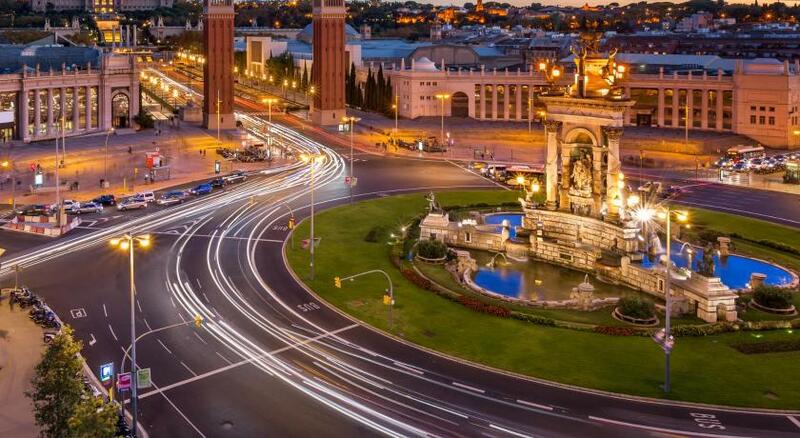 Guests can enjoy excellent connections with every means of public transport to easily visit Barcelona. We have a very complete cuisine offer in our 3 restaurants, own parking facilities and free Wi-Fi in all rooms and public áreas. 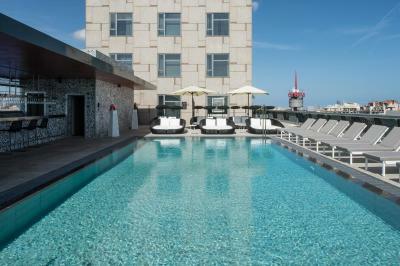 Our swimming pool in the panoramic terrace and most of the rooms have unbeatable views. 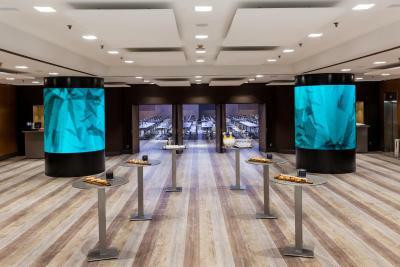 Together with the gym and our 12 meeting rooms Catalonia Barcelona Plaza offer you a combination of service and price in a privileged location. 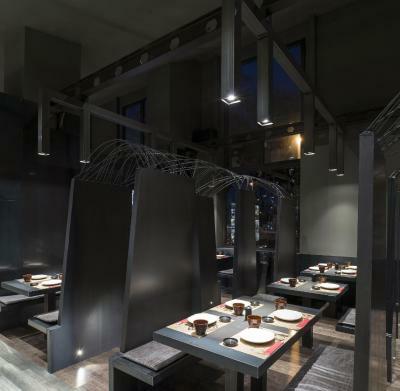 House Rules Catalonia Barcelona Plaza takes special requests – add in the next step! Catalonia Barcelona Plaza accepts these cards and reserves the right to temporarily hold an amount prior to arrival. Please note that children under 18 years of age must be accompanied by an adult. 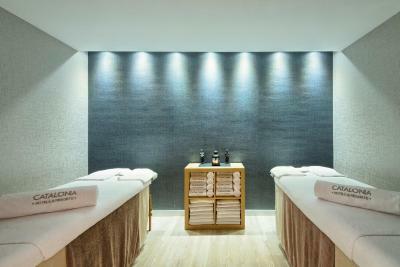 Children under 14 cannot access the spa. The bar, bit like a works coffee room. The view from the windows. You have very little view. The room is clean and big. All is modern and in order. Really enjoyed the room, it was organized and modern. Area is great, is to go with the metro and more or less walking distance everywhere (if you like to walk. 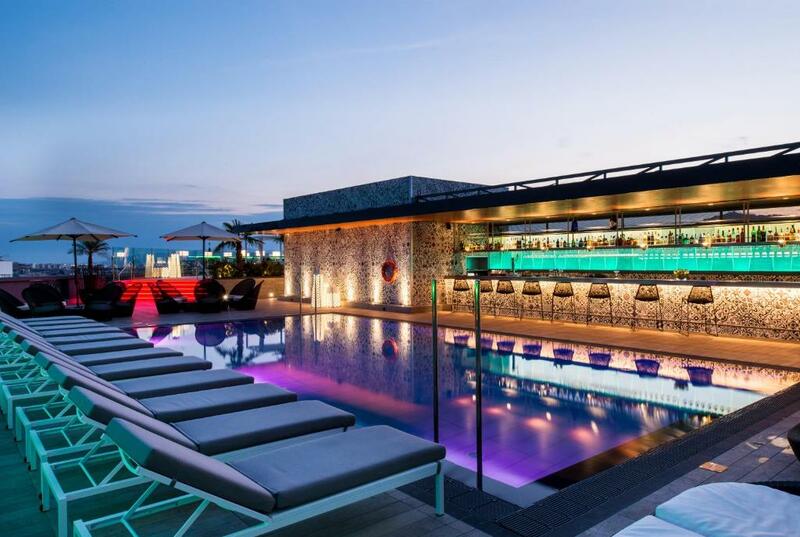 Nice roof top with the lounge and pool. Have nothing negative to say about this property. Construction was on the roof while we were there but it wasn’t too bad. Staff was super helpful and the breakfast was awesome. Location was so close to the metro. I found the staff rude and very unhelpful. I asked for an iron and ironing board on three occasions and each time I was told there wasn't one available. I also ordered room service which just never arrived. The air conditioning didn't work in the room and it was so warm. 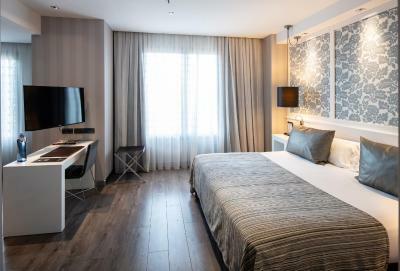 My room was so noisy it was depressing me after 2 nights, it's right on the most major island in Barcelona and from around 5am all you can hear is traffic, cars and bikes accelerating and due to it being so wide, horns every few minutes.....ask to be moved, sorry, we're fully booked. 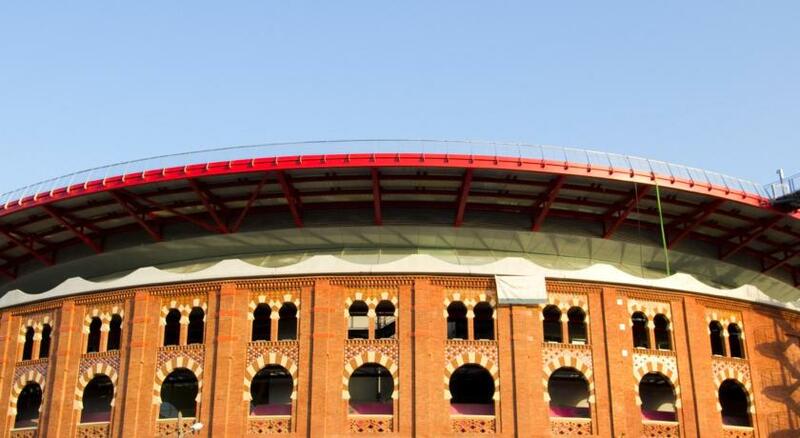 The location for me, having been many times to Barca is poor but I guess it depends on what you're looking for. 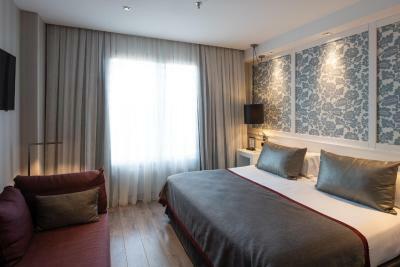 I'd prefer to be towards the marina or beach front where there are some lovely places to eat and drink and also plenty of shops etc, even La Ramblas is a 15 minute taxi journey from here and for the quality of the rooms and hotel in general I'd say this place is over priced. The bathrooms and showers were poor, kind of like you'd expect to find in a budget hotel. The hotel was clean and tidy. 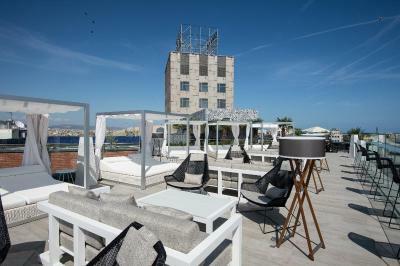 The roof terrace would be great in the summer but was very windy and cold when I went. The staff up there were very polite and helpful though. I received an upgrade of room. I liked the location of the hotel. Executive floor. Clean room. Facilities gym was very small with limited equipment, sauna was not working, no steam room spa was very disappointing. 8th floor terrace no staff ever seen at the bar by the pool. Was very disappointing as the reason why I specifically booked the hotel was because of facilities advertised. The staff were friendly and helpful when needed. Lovely breakfast buffet. I stayed one day during the weekend and I payed for that day double the rate!! The view was great. overall it was all great.